March 6, 2015 – NASA’s Dawn spacecraft has become the first mission to achieve orbit around a dwarf planet. The spacecraft was approximately 38,000 miles (61,000) kilometers from Ceres when it was captured by the dwarf planet’s gravity at about 4:39 a.m. PST (7:39 a.m. EST) Friday. Located in the main asteroid belt between Mars and Jupiter, Ceres is the largest unexplored world of the inner solar system. Dawn, designed and built by Orbital ATK, accomplished this feat with the innovative use of solar electric ion propulsion, the world’s most advanced and efficient space propulsion technology. Now in its eighth year of a nearly nine-year-long mission, Dawn has already advanced human understanding of planetary formation by giant leaps with the data it has returned over the last four years. Beginning in January, Dawn has returned increasingly sharper images of Ceres, showing a heavily cratered surface with multiple intriguing, bright features. Dawn’s image quality now substantially exceeds the best available from the ground-based W.M. Keck Observatory and NASA’s Hubble Space Telescope. By later this year, in its closest orbit around Ceres, Dawn will return images more than 800 times the resolution of Hubble. The images will provide mission scientists with a treasure trove of data to understand how Ceres evolved so differently from Vesta. The most recent images received from the spacecraft, taken on March 1 show Ceres as a crescent, mostly in shadow because the spacecraft’s trajectory put it on a side of Ceres that faces away from the sun until mid-April. 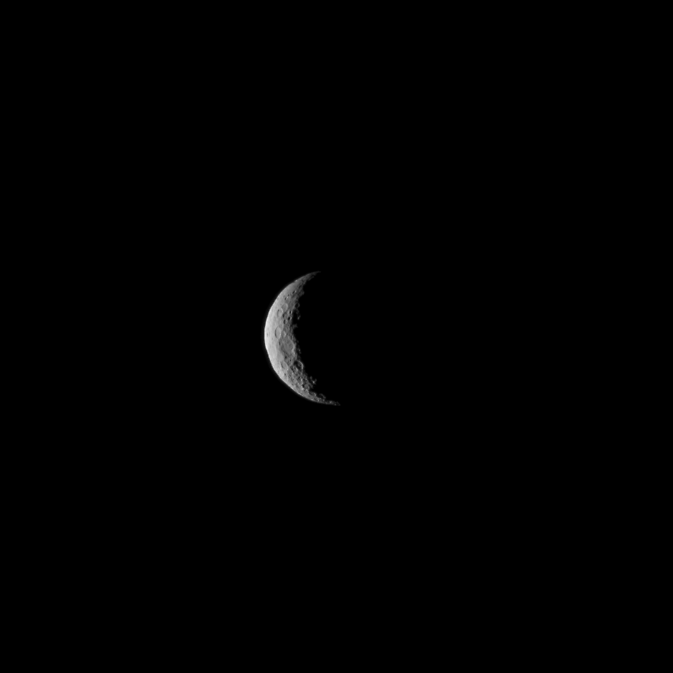 When Dawn emerges from Ceres’ dark side, it will deliver ever-sharper images as it spirals to lower orbits around the planet. In addition to being the first spacecraft to visit a dwarf planet, Dawn also has the distinction of being the first mission to orbit two extraterrestrial targets. From 2011 to 2012, the spacecraft explored the giant asteroid Vesta, the second most massive object in the main asteroid belt and the first destination on this two-stop planetary mission. The spacecraft spent nearly 14 months orbiting and mapping Vesta, returning more than 30,000 images and other measurements of the protoplanet.